Now-a-days many people are Interested to purchase there Movable (or) Immovable Assets through Bank Loans. the EMI Installment periods of your choice for every month. 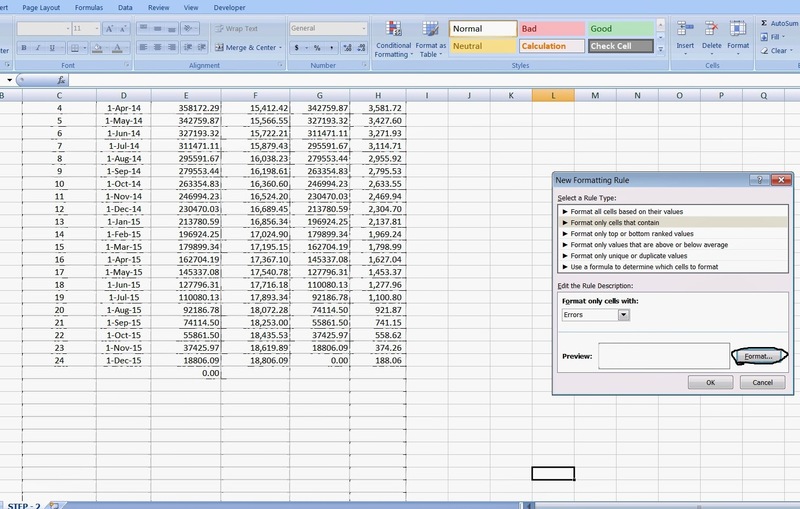 Now I am showing the different steps by which we can prepare the EMI calculator in EXCEL. 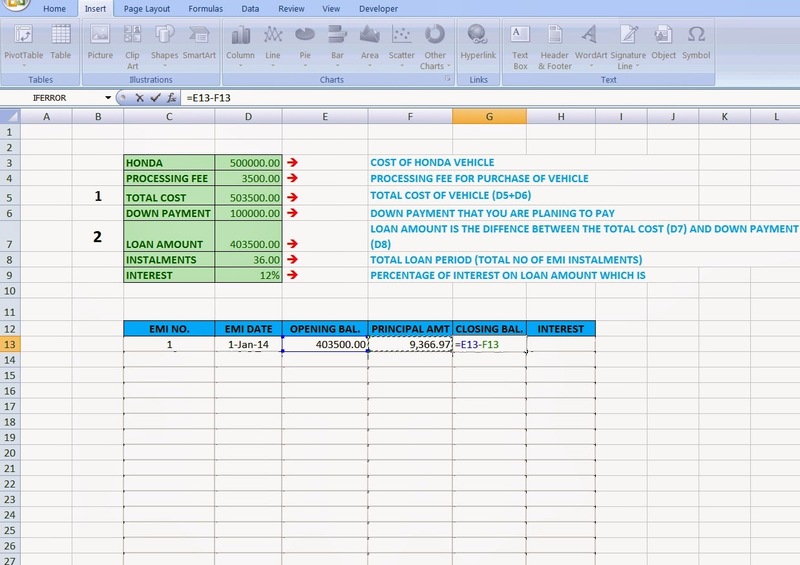 First you prepare a statement containing the basic details which will be the base to Prepare the EMI Calculator, I have given below the details for purchase of Honda Vehicle as sample. Then create a statement of EMI Calculator as given below with the following columns with No. of rows as your desire. 1. EMI NO : Indicates the Installment Number. (a) First start with first row of EMI NO. 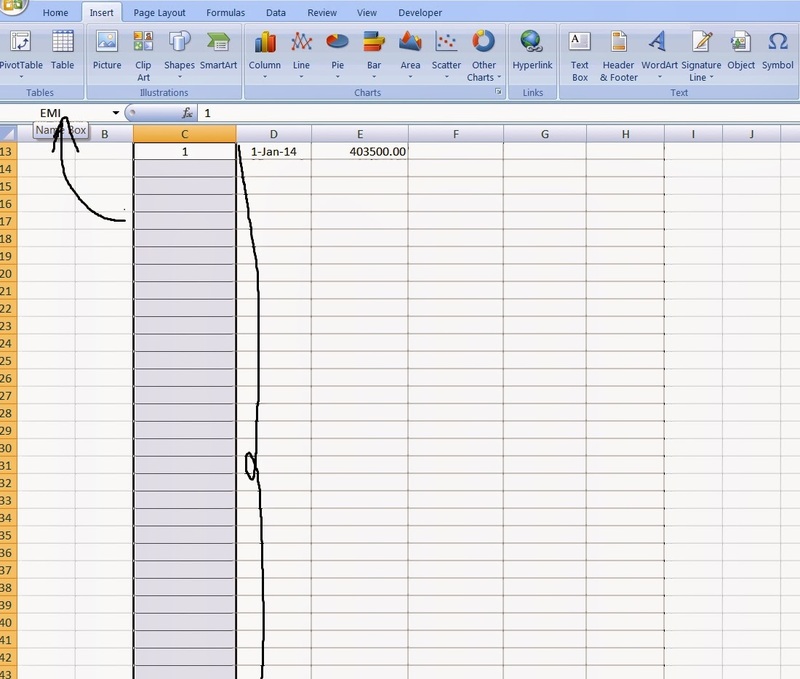 with entering "1"
then by double click you will get the formula for the hole row. and C17 is the starting cell which we have mentioned as "1". 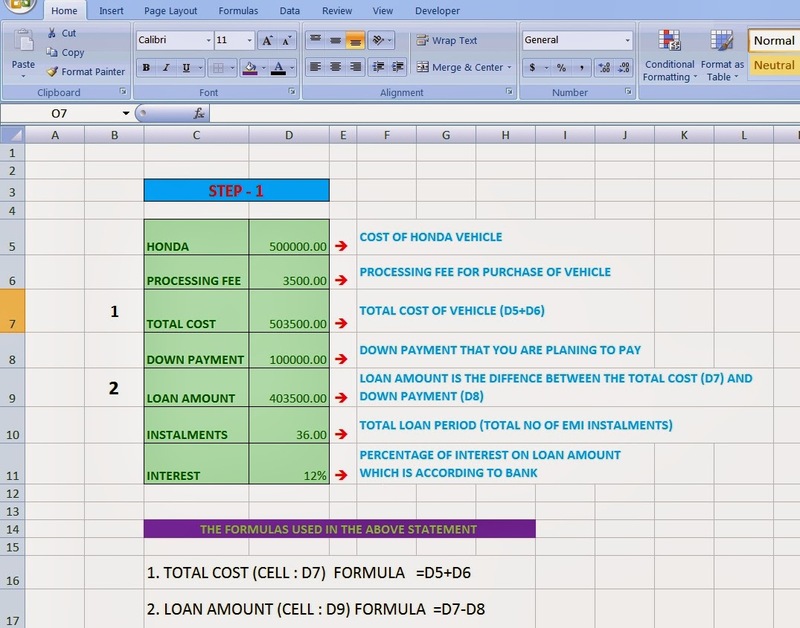 This formula is used for obtaining the complied rows and if the closing balance is "0" it will be blank.And with this we can get the perfect result when we change the no of installments or any other columns in the first statement. Note: you will obtain the result when we enter the closing balance amount. should be in the date format. eg: starting date : 01.01.2014 by applying above formula we will get 01.02.2014.
and D17 is the starting cell which Contains the starting date. (AND) if the closing balance is "0" it will be blank. Select the first row (EMI NO ROW) from 1 to end of the row and give the name to the Row, and then press enter to freeze the row, I have given as "EMI". 2. Per (EMI NO. ROW) : enter the name which you have given to freeze the Row of EMI No. By this you will get the Principal amount. Note: do not press F4 for "PER". 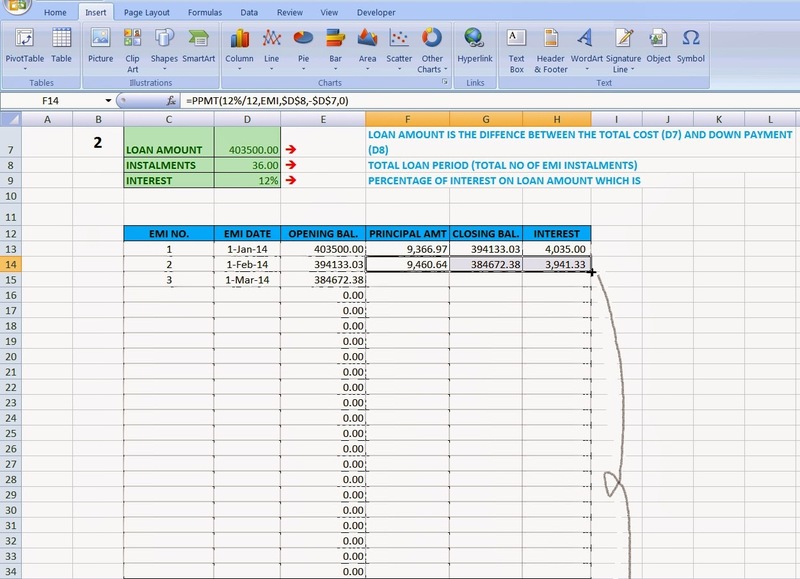 As you know Closing Balance is the difference between the opening balance and Principal Amount. By entering the closing balance you will able to find the EMI NO. AND EMI DATE in the second Rows. 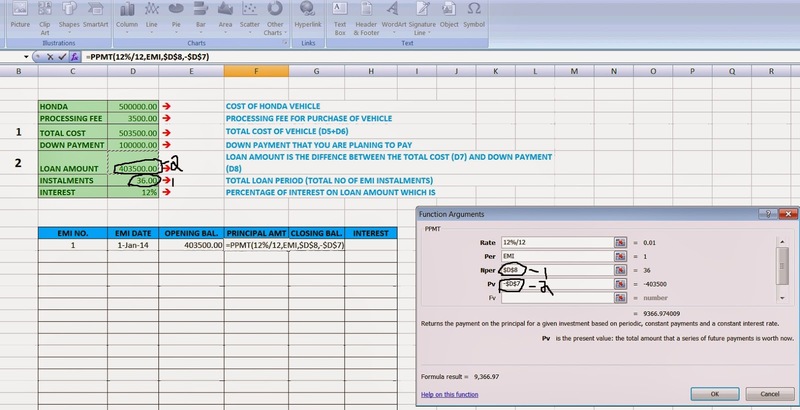 you will get the Function Arguments table and fill up the fields as same procedure stated in calculating the Principal amount. Then you will get the Interest amount for that month. By this we have completed with the formulas. Then I will show how to fill the remaining cells also. As everyone know that the closing balance of last month is the opening balance of the current month. So, copy the cell containing the Closing balance of the last month as given below. 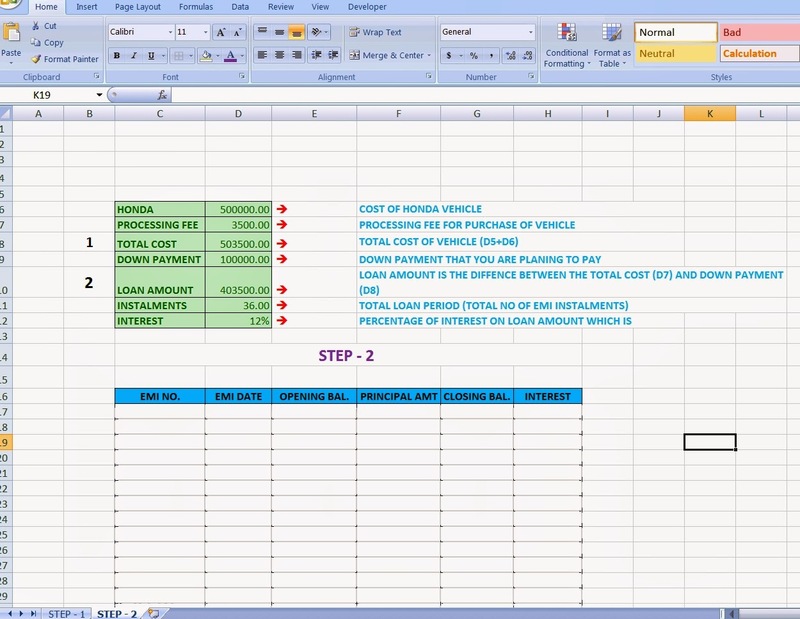 To copy the formulas for the second month select the first column from principal column to interest column and when you place the mouse on the edge of the selected cells as shown below you will find "+" mark so,hold the mouse near "+" mark and then drag the selected cells to next row of three columns. 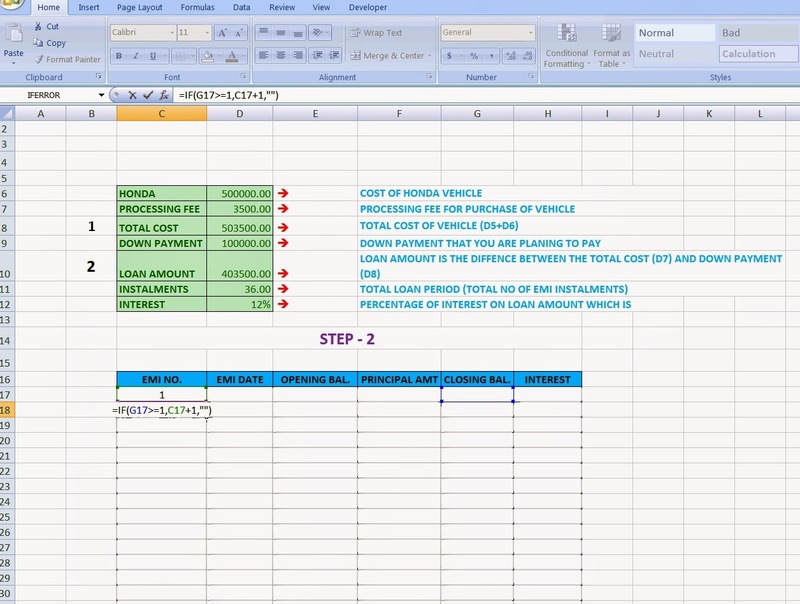 Then again copy the closing balance of previous month (i.e., 2nd month) in the cell of opening balance of the 3rd month and then select the 3rd month opening balance cell and double clink on the "+" mark which you find on the corner of the cell. 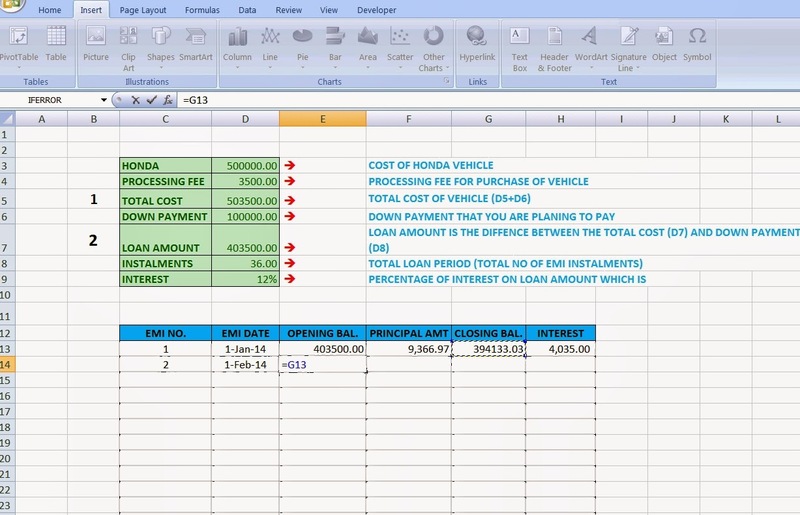 Note : you will obtain 0's for the remaining cells as we have not yet fill the cells of principal amount,closing bal, and Interest Amount. 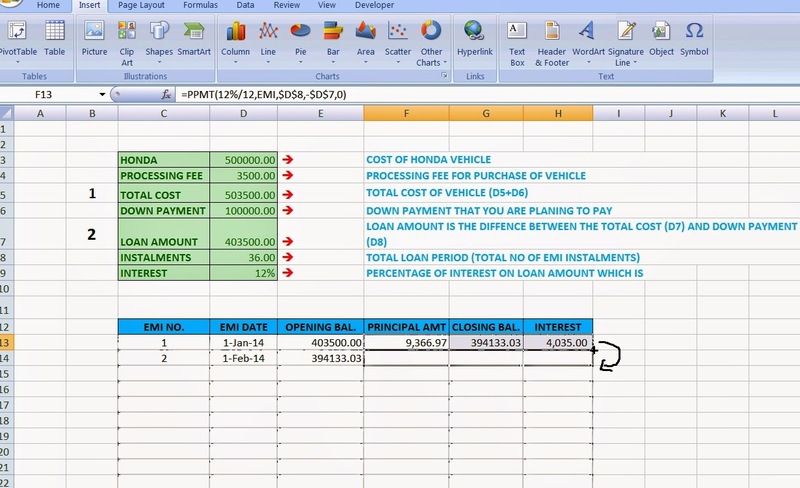 Select the 2nd month of the 3 columns of Principal Amount,Closing balance and Interest and then you find "+" mark at the end of the 3 selected columns and then double click , by this we can able to find the full table. And you can find the Closing balance as "0" for the last installment. You can get the EMI Calculator as per your desired monthly installments,down payment,cost price etc., by changing the No. of Installments, and other amounts in table - 1 except the interest rate i.e., "12%". But you may prepare your own EMI Calculator of any desired rate of interest in table - 1. By changing the No. 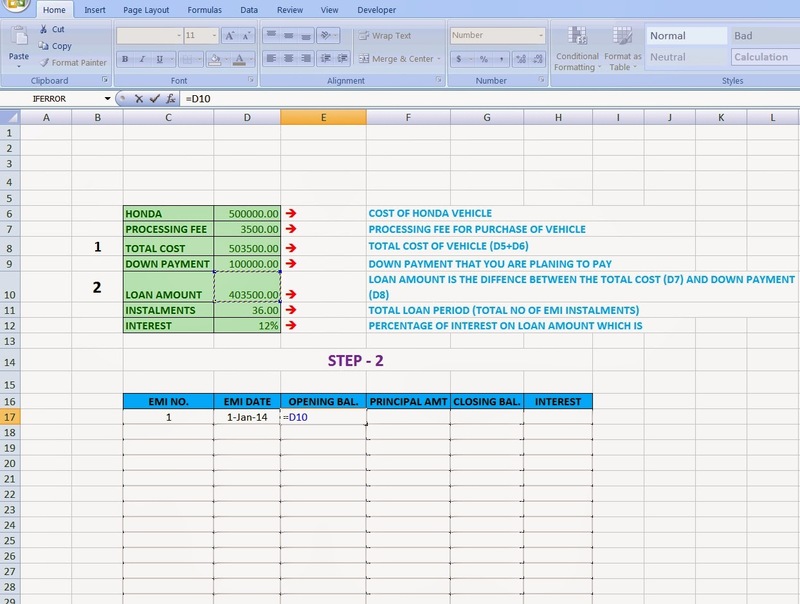 of Installments if the period is decreased you may find error as #VALUE! 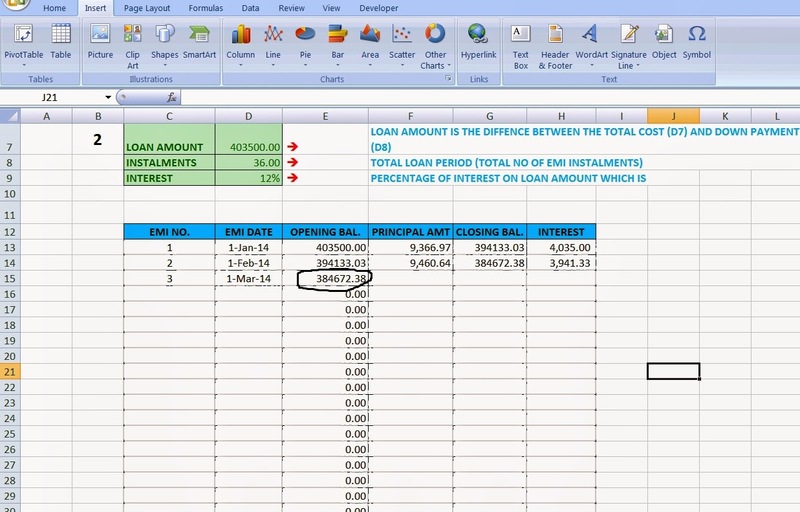 for the remaining cells which are after closing balance is "0". So, to Format the cell containing the error the following steps to be followed. This is very useful for preparing other statements also. 1. Select the entire table from EMI No. "format only cells that contain". 4. Then in "format only cell with " select "Errors" as given below. 5. Then press the Format button in the New formatting rule select White color in color selection then press "OK" in Format Cells and "OK" in the New Formatting rule. Then you can find that the error cells changed in white color. I think this is clear for you for preparation of EMI Calculator. Below You can find the Sample of EMI Calculator prepared by me in which you can change the Installment period,loan amount etc., except Interest Rate.